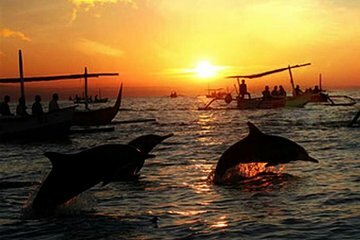 See dolphins in their natural habitat and discover north Bali’s highlights without the trauma of self-driving on this comprehensive private day tour. Start with a sunrise dolphin viewing trip to Lovina, progress to towering Gitgit Waterfall, then visit the lakeside temple Ulun Danu Bratan. Naturally, your day includes door-to-door round-trip transfers from your hotel. We were picked up super early in the morning for this tour. Our tour guide was right on time at 3am. We promptly fell asleep on the ride there. At 6am, we were loaded onto a boat/outrigger to go find the dolphins. They surely didnt disappoint. So many pods of dolphins swimming nearby. We spent about an hour on the water before heading back. From there we took a trip to Gitgit Waterfall, the twin waterfalls. We were met with another local tour guide who explained the history and life behind the village of Gitgit. Being so far north of the island, they rely on tourism and local farming. The waterfalls were beautiful. We did not go for a swim, but with the wind and mist coming off the waterfall, you would get pretty drenched.